Knight Bathmat is soft and has a dual colour to create character to your bathroom. Microfibre material means it is quick drying. 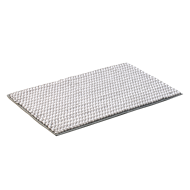 The backing is non-slip to prevent movement of the mat.